The Swedish Royal Court revealed through a press release on Friday 25 April 2014 more details about the christening of HRH Princess Leonore of Sweden. The christening will, as earlier stated, take place at the Royal Chapel of Drottningholm Palace on 8 June 2014 at noon. The christening ceremony will be officiated by Archbishop Anders Wejryd assisted by Chief Court Chaplain of the Royal Court and Bishop Emeritus Lars-Göran Lönnermark and Vicar of the Royal Court, Court Chaplain, Michael Bjerkhagen. The latter two also officiated at the wedding of Princess Leonore's parents, Princess Madeleine and Chris O'Neill, on 8 June 2012. After the christening ceremony there will be a reception for all of the 160 guests, followed by a private lunch hosted by the King and Queen for about 100 guests. The invitations were sent out on Wednesday 23 April. Among the invited guests are the closest family, representatives of the Parliament (the Riksdag), Government and the official Sweden. Princess Leonore will wear the same christening gown as Princess Estelle had in 2012, while the baptismal water will be taken from a spring at Öland. The names of the six sponsors will be announced in connection with the christening. Norsk Slektshistorisk Forening's (The Norwegian Genealogical Society's) contribution to the celebration of the bicentenary of the Norwegian Constitution was launched at the National Archives in Oslo on Saturday 26 April 2014. 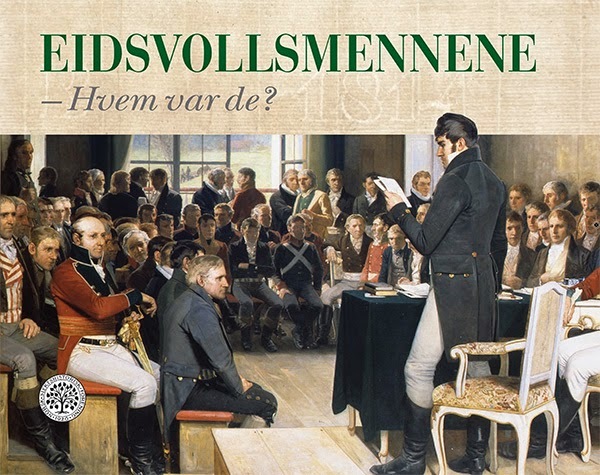 The book is called "Eidsvollsmennene - Hvem var de?" ("The Eidsvoll Men - Who were they? "), and covers the closest family and ancestry of the 112 men who were elected to the Constituent Assembly at Eidsvoll and passed the Constitution of Norway in May 1814. To be more exact, in the book you will find genealogical details on the Eidsvoll Men's spouses, children, siblings as well as their ancestry back to their great-grandparents, in addition to a short biography, their portrait (if found) and their seal. It has not been possible to find all the details on all the Eidsvoll Men, but for most of them. The book gives the current research status. Hopefully it will some time in the future be possible to find more information, and hopefully the book can be a useful starting point for future articles and research about various aspects of the Eidsvoll Men. Among the contributors to the genealogy are well-established historians and/or genealogists like Lars Løberg, Knut Bryn, Hans Cappelen, Elin Galtung Lihaug and Torkel Fagerli, to mention a few. The head editor is Anders Bjønnes, while the other members of the editorial commitee are Håvard Blom and Svein Becken. The same men were also main responsible for the book Segltegninger fra hyllingene i Norge 1591 og 1610 ("Drawings of Norwegian Seals from 1591 and 1610") which was published in 2010. Yours sincerely has contributed to the chapter about Arnoldus von Westen Sylow Koren (1764-1854) of Bergen, later Ullensvang. In additon to the genealogy the reader can find a short introduction to the events in 1814 written by the historian Håkon Andreas Evju, an article about the use of seals in Norway (by Anders Bjønnes), another article about what the seals on the original Constitution of 17 May 1814 can show us (by Hans Cappelen) and a description of each seal (by Anders Bjønnes and Hans Cappelen together). The book is richly illustrated and also has a personal name and place name index. The book is meant to reach out to a wider audience of people interested in the genealogy of the Eidsvoll Men and the history of 1814. The book, which has 269 pages (including the list of illustrations and the presentations of the contributors to the book) in addition to the index (pages 276 to 320), would be too expensive to produce if also the notes (the research material) should be included. The research material will be made available through the Norwegian Genealogical Society. The book (ISBN 978-82-998428-2-2) costs NOK 495,- + P & P and can be ordered from the Norwegian Genealogical Society by e-mail (kontor [at] genealogi.no) and soon also directly from the website (the online shop is just around the corner). See also more information about the book (in Norwegian) here. The Swedish Royal Court announced today, 16 April 2014, that the christening of Princess Leonore of Sweden, the daughter of Princess Madeleine and Chris O'Neill, will take place in the Royal Chapel at Drottningholm Palace outside Stockholm on Sunday 8 June 2014. 8 June happens to be Princess Madeleine and Chris O'Neill's first wedding anniversary. They married in the Palace Church in Stockholm on 8 June 2013. Princess Leonore, the second grandchild of King Carl XVI Gustaf and Queen Silvia of Sweden, was born in New York City on 20 February 2014. Her name was announced in a Council of State six days later. "During 2013, His Majesty The King attended 314 official events in Norway and abroad, while Her Majesty The Queen attended 98 official events, His Royal Highness The Crown Prince attended 200 official events and Her Royal Highness The Crown Princess attended 72 official events. The Royal Family visited 47 municipalities in 16 counties and Svalbard in Norway, and paid several visits abroad. The King and Queen carried out their annual county visit in Sør-Trøndelag county in June, while the Crown Prince and Crown Princess visited Vest-Agder county in September. The King and Queen conducted a State Visit to Turkey in November, while the Crown Prince and Crown Princess travelled to the USA for an official visit in May. In 2013 the Royal Court completed its modernisation and rationalisation process, and all Court employees have now been consolidated into a joint overall organisational unit. A report on the use of the funds allocated to the Royal Court (the Civil List) and the staff of the Crown Prince and Crown Princess by the Storting is submitted annually. The allowances provided to the King and Queen and to the Crown Prince and Crown Princess, respectively, are meant to cover the management, operation, maintenance and development of the private properties, as well as official attire and private expenses. The accounts for the Civil List showed a deficit of NOK 6 701 468. This deficit will be covered by previous appropriations. The accounts for the staff of the Crown Prince and Crown Princess showed a deficit of NOK 37 251. This deficit will be covered by appropriations from previous years. The accounts for “Åpent Slott” (cultural outreach activities) showed a surplus of NOK 373 266. This surplus will be transferred to equity capital." Not surprisingly the press and the social media focused on the deficit of NOK 6 701 468, but many left out the fact that the deficit was to be covered by previous appropriations. It is not as if the royal family and court are on their uppers. The activities and the costs seem to be well planned. The Norwegian tabloid VG wrote in its coverage of the annual report that the celebrations of the crown prince couple's 40th birthdays last year cost as much 2,4 million NOK. In addition security cost as much as 2,7 millions, taken from the police force budget. Crown Prince Haakon's 40th anniversary was marked by a music festival in the garden at the Skaugum estate, where numerous royal guests were entertained. Obviously a party on such a large scale has to cost something. The court's information director, Marianne Hagen, confirmed the numbers, but "had no further comments". Maybe not the best reply, but then again what should she have said? Simply that this is what a party like this costs? Many people would then say how the money could have helped the sick and elderly. It is hardly possible to win an argument about the cost of royal celebrations. But it should be stressed that the expenses were covered by the civil list, not by any extraordinary grants. And concerning security costs, even a president would need security if he was to hold a private party. The annual report reveals that 22 persons received the Royal Norwegian Order of St. Olav in 2013, compared to 27 in 2012 and 30 in 2011. Among those 22 were Queen Máxima of the Netherlands, President Abdullah Gül of Turkey (both Grand Cross) and the composer and musician Henning Sommerro (Commander). 61 persons received the Order of Merit (all classes combined), among them Barry White, the US Ambassador who left Norway in September 2013, and has not yet been replaced. President Barack Obama has nominated George Tsunis to the post as Ambassador to Norway, but he has not yet been confirmed by the Senate. As you might recall, he did not do too well at his confirmation hearing, and Senator John McCain has said he would fight the appointment when it is finally voted over in the Senate. But back to the annual report again! The Medal of St. Olav was awarded to only one person, in 2013, Johan Beck, who has served as a verger at the Norwegan Seamen's Church in Stockholm since 1974! In addition there were 162 recipients of the King's Medal of Merit, among them Tove Fleischer from my home town Sandefjord. Fleischer has for many years been in charge of the local society for the protection of animals and has done a fabulous job, so it was well deserved. The King's Commemorative Medal was awarded to 9 persons in 2013. The medal is conferred for "particularly meritorious service to His Majesty the King", and among the 9 persons were one of the King's drivers, Bjørn Einar Lindstrøm. 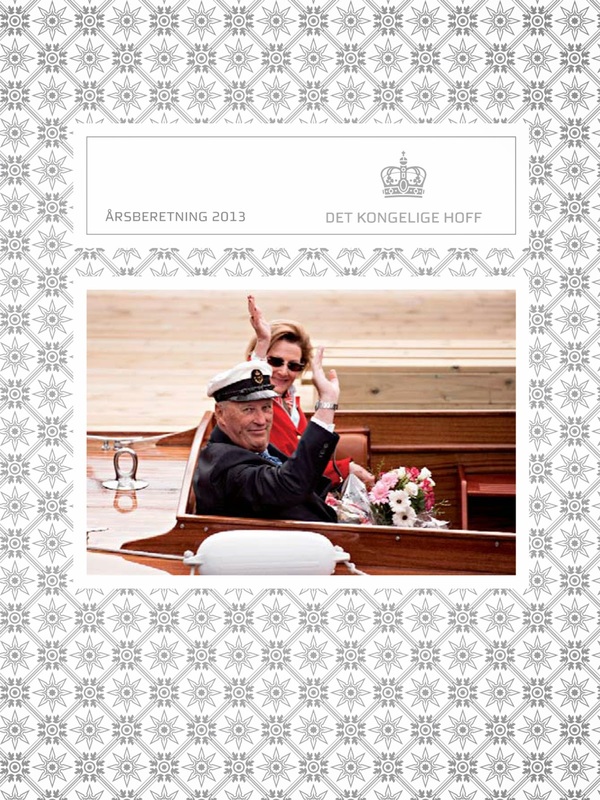 The annual report 2013 can be downloaded here. For earlier annual reports, go here. See also my earlier blog articles The Norwegian Royal Court. Annual report 2012 (published 17 April 2013), 2011 (published 11 April 2012) and 2010 (published 12 April 2011).